Home > Resources > Recover Samsung > How Can I Restore Lost Data from Samsung Galaxy? "Last night, my Samsung Galaxy S8 phone crashed suddenly. Then I had to flash my device. However, when I restarted it, all data on my phone had gone. That was totally a big blow to me, because I forgot to backup my phone. Do you know how to recover lost data from Samsung Galaxy phone? Please do me a favor. Thank you very much!" Below, we will list the main reasons behind data loss in Samsung Galaxy devices and later we will see how the Samsung Data Recovery works. Part 2. How to recover lost files from Samsung Galaxy devices? 2) Damage your Samsung phone accidentally. There are still other causes can lead to data loss issue on your Samsung Galaxy devices. They are out of our control but we are possible to restore lost data from Samsung phones and tablets. 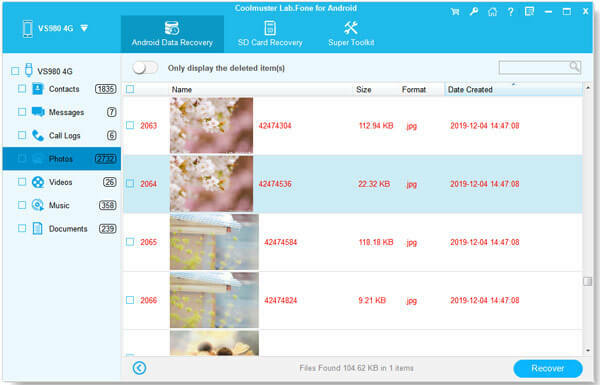 As I mentioned above, Samsung Data Recovery is fully capable of recovering lost files, including contacts, text messages, call logs, photos, videos, audio files, documents, etc. from Samsung and other Android mobile devices. It supports more than 6000 Android models. Just follow the steps below to let the Samsung Data Recovery restore lost data from Samsung Galaxy Android devices. First of all, download and install this Samsung Data Recovery on PC. Then double click to open it and link your Android device to computer via a USB cable. The connected Samsung device will be detected by the program. As soon as it recognizes your Android phone, this program will start to scan it deeply. Soon your lost data will be listed on the main interface as shown. Now you can enter the folders to preview your deleted files at will. After that, you can mark the whole lost files or some of them to recover. At last, hit the "Recover" icon, you will restore all deleted files to computer in a short time.